Charter Flight Group is the global leader in superior and exclusive private aircraft charter flights and aviation services. Thus, if you are in the search for a private charter flight to Richmond, Virginia, look no further. No other charter flight company can give you the ultimate private jet plane travel experience than Charter Flight Group can. We definitely are not your typical run-of-the-mill private jet company and we always endeavor to deliver incomparable charter travel solutions to our clients, whether it is a local flight or an international one. We got you covered. As we strive to make your private charter flight more convenient, more comfortable, and more efficient, we guarantee you the most cost-effective private charter as well. Although there is indeed a difference in pricing between a commercial airline and a private jet flight, the difference is compensated with top-notch service and expediency that only a private charter like CFG can give to even the most demanding traveler. In fact, aside from skipping the long lines, the waiting, the agonizingly rude passengers, and the low-quality in-flight service, you will also be given the privilege to pick your own private jet plane. With Charter Flight Groups vast database of the industry’s highest quality aircraft, you will definitely find the private jet plane that will suit your traveling needs. For instance, you can pick the Hawker 900XP, a mid-sized jet plane that can comfortably accommodate as many as nine passengers. In this jet plane, you will be treated like royalty with the most luxurious amenities and services that can only be found in a Charter Flight Group’s private jet flight.But more than just luxury, comfort, and convenience, we provide our clients the safest way to travel as well. Each and every one of CFG’s jet planes are audited not only by the US government’s Federal Aviation Administration (FAA) but also by the world-renowned Wyvern and the Aircraft Research Group of the United States (ARGUS). At Charter Flight Group, your safety is our foremost priority and thus, we maintain the highest possible safety and security ratings to make sure that you fly worry-free in your private aircraft jet flight. Flying to Richmond, Virginia means landing on the busiest airport in all of Central Virginia – the Richmond International Airport (KRIC). This airport is a joint civil-military airport which is approximately 5 miles east of the central district of Richmond. The Richmond International Airport is dubbed as the “best little big airport you’ll ever visit” and it is not hard to understand why. The airport, despite of its average size, has served as the gateway to Richmond and to other parts of Virginia for almost 10 decades. An average of 3 million travelers every year bears witness to the airport’s competence and quality service.Landing your private jet plane on Richmond International Airport is but a breeze. The airport’s new and exciting facilities and amenities – part of its recent $300 million renovation – will supplement and complement the superb and stress-free flying experience that you had on your chartered flight. You’ll see that the airport’s sophistication and modernization matches your private aircraft sleek and modern build and will continue the convenience that you’ve found on your private aircraft charter flight. This airport is simply the most hassle-free air travel option in the center of Virginia. If you are planning to do business in Richmond, Virginia then your chartered private flight will never be wasted. 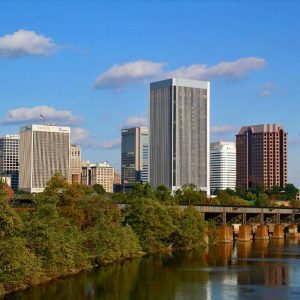 As the capital of the state and the center of trade and commerce, Richmond has always been a dynamic focus of both national and international businesses. In fact, more than ten Fortune 1000 companies headquartered in the central district of Richmond as doing so makes perfect sense. 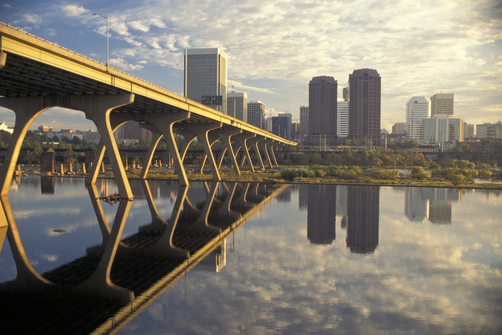 Richmond’s location is one of the many reasons why the city is big in business. Being in the center of New York and Florida is a great advantage. This geographic trait allows the city to be the gateway to the southern United States and the center of business by internationally admired companies like DuPont, HP, Capital One and so much more. Thus, if your private charter flight to Virginia is for business, you’ll find it easy to find and see the future from this city. However, if you plan to charter a jet to Richmond just to roam around the city and visit motivating new places, you won’t be failed as well. In Richmond, you will discover both history and adventure at its finest. Thus, walking around the city, you will find the most enchanting museums and architecture that you thought only exist in history books. More than just magnificent history, Richmond also offers exciting outdoor recreations, appetizing delicacies, appealing events, and exhilarating shopping experience. All these and more, is just one private jet plane travel away, so don’t hold your breath and book your trip now. Why Choose Charter Flight Group for your Charter Flight to Richmond? Charter Flight Group will organize your private charter flight –whether it is planned or unplanned. Our trained and experienced customer support will guide you on your way to luxury and indulgence from booking to flying to landing and even to roaming around the city of Richmond. We offer a truly custom-made service and thus we make sure that your private charter flight is precisely tailored to your traveling needs. Charter Flight Group provides exceptional and unparalleled amenities, facilities and services aside from guaranteed safety and security. Try it for yourself and you would be coming back for more.